It was a scene that shocked and saddened onlookers at the scene, as well as viewers around the world on Monday morning: The world-famous, history-filled Notre Dame Cathedral in Paris, France, on fire. The Notre Dame Cathedral marks the heart of the city for locals and tourists alike, and is the most visited monument in Paris. The cathedral sees 12 million visitors a year — nearly double the people who visit the Eiffel Tower. Paris’ mayor Anne Hidalgo called it a “terrible fire” and asked locals to respect the security perimeters around the scene. 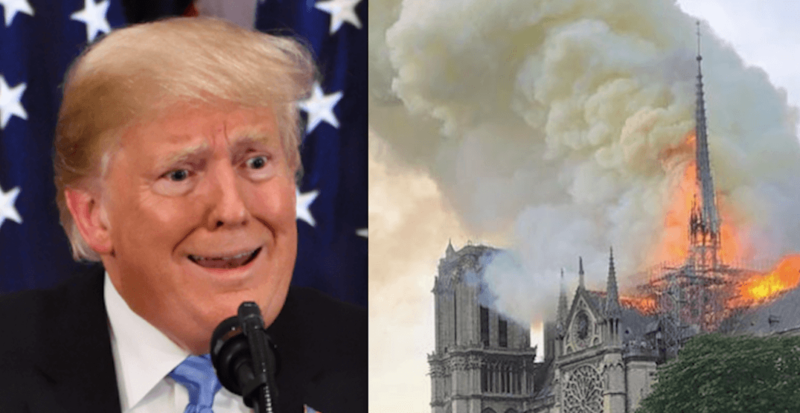 Now, in case you haven’t been following along, the Notre Dame Cathedral is an 850-year-old structure, so it goes without saying that dumping gallons and gallons of water on it directly from above all at once may not actually be the best idea. So when Trump chimed in with his suggestion, firefighters in Paris were quick to respond to his idea. Yes, the collapse of the entire structure. So yeah, maybe hold off on the “flying water tankers” for now.